In her New York Times review of Sea of Poppies, Gaiutra Bahadur called Amitav Ghosh (the novelist) an “archaeologist of the powerless.” Here, in The Great Derangement, Ghosh continues to gravitate toward power vacuums—this time in the literature, history, and politics of climate change. 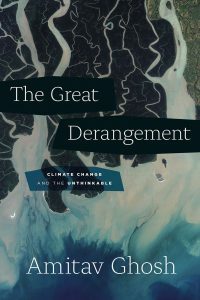 Rather than promulgate doom and gloom or point the finger unidirectionally at X (these have been the dominant modes of climate critics to date), Ghosh’s book burnishes genres like sci-fi, exposes the ellipses of history, and pressures the political present, all while illuminating Culture’s way back to rafts of rational thought. To read more about The Great Derangement, click here. To read the Rumpus review in full, click here.